DUBLIN AIRPORT HAS opened a new €16 million facility close to Terminal 2 which will cater for passengers connecting between flights. 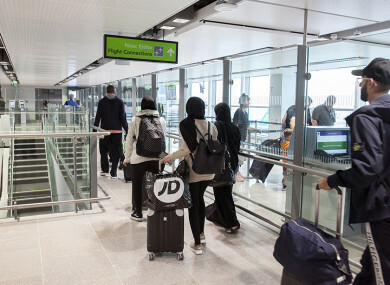 The number of passengers transferring at Dublin Airport has increased from 550,000 in 2013 to almost 1.6 million passengers last year while connecting passenger numbers are up a further 17% this year. The new three-story facility, which has the capacity to cater for four times more passengers, hopes to enhance the airport’s ability to compete for transfer traffic between Europe and North America according to Dublin Airport Managing Director Vincent Harrison. “Growing this part of our business is hugely important in helping us to expand our route network at Dublin Airport, as these additional transfer passengers underpin the viability of a route and also encourage airlines to launch new services and add capacity on existing routes. Dublin Airport has many advantages as a gateway between Europe and North America for transferring passengers. “Our location is perfect, we have strong transatlantic, short-haul and Middle Eastern connectivity and US preclearance provides passengers travelling to the United States with a wonderful product that allows them to arrive as domestic passengers in the States,” Harrison said. 2018 has been the busiest summer ever for Dublin Airport, welcoming more than 100,000 passengers per day and a total of 14.7 million passengers so far this year. Dublin Airport is the sixth largest airport in Europe for flight connections to North America with the number of flights to and from the US up 14% this year. An art installation inspired by the Johnny Cash song 40 Shades of Green, will feature in the new transfer facility as part of the airport’s ongoing sense of place project, which aims to provide passengers with a sense of Ireland’s culture and history while at the airport. Email “Dublin Airport opens €16 million transfer facility for connecting passengers”. Feedback on “Dublin Airport opens €16 million transfer facility for connecting passengers”.